ATLANTA – Whether by design or circumstance, the Falcons’ defense looked like a much more aggressive version of itself during Atlanta’s 40-14 victory on Sunday. Atlanta notched a season-high seven sacks against the Arizona Cardinals (3-11), and the Falcons (5-9) were in rookie quarterback Josh Rosen’s face all afternoon. 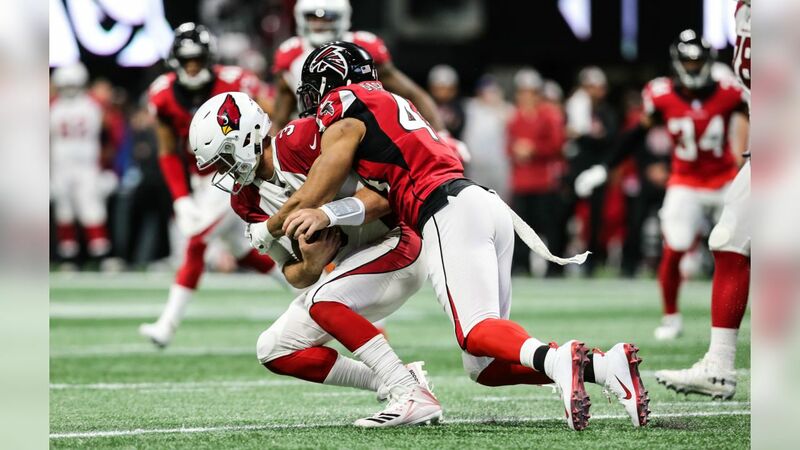 The Falcons dialed up a number of blitzes to get after Rosen quickly on Sunday, and they were effective in limiting the Cardinals’ offense, which only managed to top 250 yards with a garbage time drive in the fourth quarter. Six different Falcons defenders got to Rosen on Sunday, and they got there in a variety of ways. When they didn’t get Rosen to the ground, the Falcons made his job very difficult. Vic Beasley was one of three defenders with multiple pass defenses, and it was a batted ball that really sparked Atlanta’s 40-point afternoon. After falling behind 7-0, Beasley knocked a Rosen pass into the air, which linebacker Deion Jones intercepted and returned 41 yards for the first points of the game for the Falcons. That play energized Mercedes-Benz Stadium and jump-started the strong defensive effort. Beasley, in particular, had a good game along the defensive line. The former first-round draft pick had three tackles, two tackles for a loss, two pass defenses and a sack. But he performed much better than that stat line indicates, generating pressure consistently and diagnosing plays quickly all afternoon. The other standout along the defensive line was Grady Jarrett, who led the team with seven tackles, including two tackles for a loss, to go along with two sacks and a forced fumble. It was the forced fumble, which came on his first sack of the game, that helped the Falcons establish a 10-point lead early in the second quarter. Atlanta’s ability to create pressure consistently also had a positive impact on the secondary. Because Rosen was unable to get comfortable in the pocket, the Falcons secondary also played with greater aggression. Atlanta’s cornerbacks were jumping routes and knocking passes away, preventing the Cardinals from sustaining drives while the Falcons’ offense continued to pile on points. That combination created a bit of a snowball effect. The more their lead increased, the more aggressive the Falcons could play. That aggressiveness fed into Atlanta’s ability to create turnovers and produce sacks.